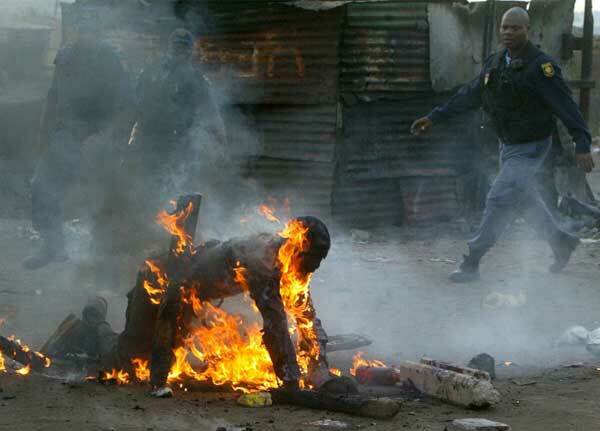 I’m in Durban and another Afrikan Brother has been burnt alive – because he was Black and not South Afrikan. He is seen as the enemy. The element that must be sacrificed on the altar of Black Self Hatred. The champions of White Supremacy have been handed yet another award. And this time they didn’t have to lift a finger. For years now, waves of violence against so-called “foreign nationals” (but, of course, it is not the French, the British or even the Chinese – it is exclusively Afrikan/Black people) have broken out at alarming rates all over the country. Shops are looted, houses set on fire and people burnt alive. Groups of people have to flee and seek refuge in places not fit for living. All because “they” are not “from here” and they are “taking our resources”. 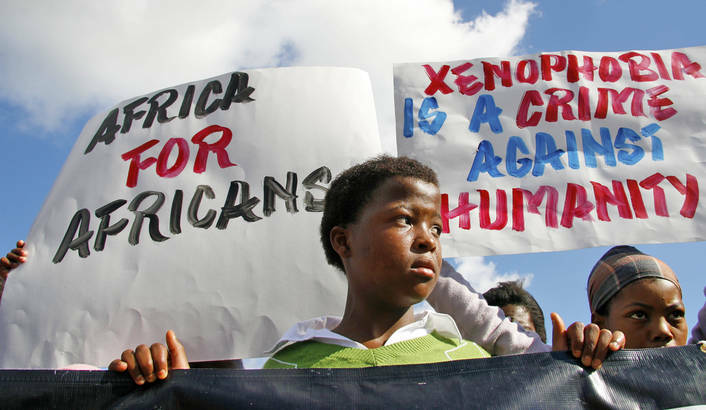 Mis-labeled as “xenophobic attacks”; it is not that. It’s Afriphobic hysteria of self-destruction. Honestly, I thought I had heard the craziest language of hatred in my experience with Norway and Europe. But hearing Black South Afrikans say “they must go”, “they have overstayed their welcome”, “they are criminal elements” and “they are illegal in this country” about Sisters and Brothers beats the sting of any white saying something similar. Too many Black South Afrikans don’t hear themselves. They are directly copy-cat’ing the Master’s language. They have become blind zombies, carrying out Massa’s Plan of Genocide, yet BELIEVING they are setting the stage for community justice. This is NOT a case of “cleaning up” criminal elements or people who take advantage of opportunities. This is about Black Genocide. Many people from other parts of Afrika have helped to boost the status of informal trading and entrepreneurship through the many pop-up business entities of selling second-hand clothes, expanding the fast-food industry, computer/mobile-related services, grocery stores and corner-shops. This is INCREDIBLY important in a whitewash economy that is set to kill small business in favour of malls and shopping centres (and you KNOW who owns them….). The Pan-Afrikan creativity in many aspects of SA’s business landscape is nothing short of genius. But, it is, by many, perceived as a threat. The scenarios take on absurd proportions; Black South Afrikans who “don’t look South Afrikan” (there is a twisted illusion planted in many Black minds here that South Afrikan complexions cannot go beyond a certain shade) are confronted and labelled ‘foreigners’; sensational and stereotyped stories of exaggeration are produced about how “all Nigerians are drug dealers” and “all Zimbabwean women are prostitutes”; the huge GRIN on Black South Afrikan faces when chasing another Black Brother down the street, looting his shop, setting him alight……; and Black South Afrikans – who largely experience no justice before the law – all of sudden chanting a message of how aggrevating it is with “immigrants who are here illegally” and “shop owners who do not hold a proper business licence”. There are intricate behind-the-scenes dynamics of South African criminals, government criminals and ‘foreign’ criminals pushing conditions within housing, drug trade, trafficking and service delivery in their lucrative favour – and the most vulnerable communities (which often include Sisters and Brothers who have migrated to SA) are the one suffering. Poor South Afrikans are sick and tired of always being pushed to the margin, and since the real enemy seems invincible, the victims for this anger becomes those who have moved in from across the border to find refuge from their own marginal experiences. Its Black against Black. Poor against Poor. And white capitalism (together with their oh-so-willing black elitist allies) remain victorious. Black life is cheap. Black and POOR life doesn’t even have a price tag. The media hardly reports the graphic violence – unless it is “trending”. Politicians are turning a blind eye. Police are implicated in the attacks. The justice system is on lockdown. The Zulu Monarch, King Zwelethini was recently quoted as saying “We urge all foreigners to pack their bags and leave” (although he has later denied this and blamed media for misinterpreting his statement). And, although there are MANY sound-thinking South Afrikans, too many are still caught up in a rhetoric of “us” and “them”. I cold-sweat when I hear otherwise progressive Black South Afrikans talk about “these people have come in to take up space in OUR townships, and must leave immediately”. As if they forget what a township – in South Afrikan reality – really is; a chamber of Black Death. A forced incarceration mechanism of control, suffocation and non-life. If Afrikans (read: Black Family Members) are coming in to set up business, live and struggle, that should be welcomed with open arms. If Black South Afrikans are truly sick and tired of injustice, there is absolutely no gain in attacking our own family. Only sick people do that (which goes to demonstrate the inherited pathology of the slave – as Bra’ Mike Stainbank so eloquently has put it). A sounder approach would, of course, be to take issue with the extreme land masses occupied by Europeans, the unlawful (according to REAL AFRIKAN LAW) mining operations of the British and the strangling grip of multinational/Western economic power in South Afrika. The scars on the Afrikan psyche and soul are already too many and too deep. We need to now exercise healing as a willed possibility instead of drowning ourselves – and each other – in more pain of Black-on-Black Death. As ‘clear-cut’ as these issues seem, they are actually blurry, confusing and overlapping. Yet, personally, I have no sympathy for any Afrikan who militantly defends country-borders that were drawn up by colonialists; uphold the “laws” of the RomanDutchFrenchBritish and willingly part-take in an absolutely anti-Afrikan scheme that only kills US. Borrowing from the rhetoric phrases King Zwelethini was recently quoted with, I URGE South Afrikans to stop, think and remember. And I urge Afrikans from all over the continent to continue to operate this continent on OUR terms; towards a border-less and self-determined continent – for Afrika, by Afrika. I salute my Somalian Brothers. I take pride in my Nigerian Family. I dance with my Senegalese Sisters. I give thanks to my Mozambiqan fellows. I rejuvenate with my Zimbabwean peoples. I sing praises with Ethiopian relatives. I’m inspired by my Malawian counterparts. I go to war with my Congolese siblings. And I am thankful to the many clear-sighted South Afrikans I’m surrounded by. I see no “foreigner” in you. I see me. I see family. AFRIKAN FAMILY.